Our May meeting included presentations by Dera-Jill Pozner, North of Panhandle Neighborhood Association (NOPNA) Board Member and prime mover of an extensive improvement plan for the Panhandle, and Isabel Wade, Friends of Buena Vista Park, who has initiated an effort to focus attention on problems in Buena Vista Park. Both addressed the specific needs of each Recreation and Parks facility in the neighborhood and expressed their support for the HANC request that in the fiscal year 2014-15, $1.1 million be added to the Recreation & Parks Department budget: $625,000 for the reconstruction/paving of the southern pedestrian pathway from Stanyan to Baker Streets in the Panhandle, and $500,000 for tree replacement and recovery in Buena Vista Park. In addition, the three neighborhood groups requested that $2 million be included in the 2015-2016 Recreation & Parks Department budget for upgrading the irrigation system in the Panhandle of Golden Gate Park. Discussion also centered on the need to developed alternatives to the failed policy of short term "sweeps" of parks to remove campers. Agreement was reached to pursue more creative solutions to the problem of camping by involving social service organizations who currently serve young people in the neighborhood. Urban School reported few changes to its plan to build on St. Agnes's parking lot. They expect to start construction in May 2015 with completion by August 2016. They will return late summer with more detailed schematics. The French-American International School's Page Street Pre-School will have 108 kids ages 3-6, and occupies the school district land on a 30 year lease. They plan to open in August this year. Several neighbors had issues about both the white zone location and the pick-up and drop-off plans. While the pick up times are spread out from 3:15 to 6 p.m., drop off is concentrated in 8:15 to 8:45 a.m. The school requires at least the parents of the youngest children to park and walk kids into school. They have 12 off-site parking spaces available for this. They think that this, plus shuttles from Oak campus, carpool encouragement, and site monitors will work for all. We asked them to return in 1-2 months to discuss traffic plans further. Art Agnos, San Francisco’s 39th Mayor, and Tim Redmond, former editor of the San Francisco Bay Guardian, came to HANC’s October general meeting to explain why they oppose Propositions B and C.
Proposition B would create a special use district comprised of solely the proposed 8 Washington project, based on the developer’s plans for the project. Proposition C is a referendum, asking the voters whether they approve an ordinance passed by the Board of Supervisors which raised the height limits in the project area from 84 feet to 92 feet for part of the project, and to 136 feet for another part of the project. Former Mayor Agnos was a proponent of demolishing the 50-foot Embarcadero Freeway, to open up the Waterfront to public access and views. He believes that he lost his re-election bid because the freeway was torn down with his advocacy while he was Mayor. The 8 Washington project would add more than 50 feet (the height of the Embarcadero Freeway) to the current height limit, and would be just the first step in building a “Wall on the Waterfront.” If Proposition B or C passes, it would be a signal to our developer-friendly Planning Commission that it is acceptable to grant exemptions to voter-approved height limits for more projects along the Embarcadero and elsewhere in the City. There are additional reasons for opposing the project. Two-thirds of the open space promised by the developers would be private and not open to the general public. The promised payment to the affordable housing fund (paid after the units are sold) is a pittance compared to the more than half a billion dollars in revenue the project will generate. Former Mayor Agnos invited the audience discuss the proposed Warriors development with him after the election. At the HANC general meeting on Thursday February 13th at 7:00pm at the Park Branch Library, representatives from the SF Public Utilities Commission (SFPUC) shared about proposed water rates increases to continue investing in San Francisco’s aging infrastructure. We also discussed as a neighborhood techniques and strategies we can use to conserve water and support a diversified supply in our homes and neighborhoods. HANC's September General meeting consisted of presentations on three separate topics: AT&T broadband boxes, MUNI's Transit Effectiveness Project, and the proposed park closure legislation. Tedi Vriheas from AT&T discussed AT&T's plans to install refrigerator-size boxes to upgrade its broadband from DSL to fiber optics. 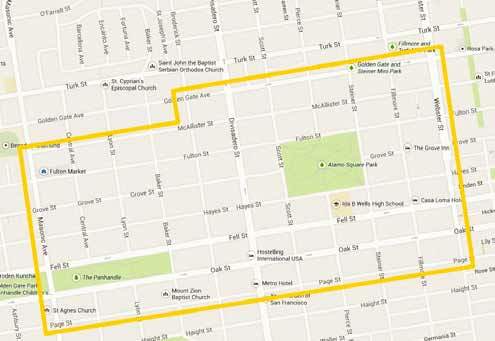 A list of approximately 40 locations in or near the Haight Ashbury where these boxes are planned to be installed was printed in the September issue of the Voice. AT&T has already obtained approval for these boxes from the Planning Commission. There is a CEQA appeal making its way through the court system, but there has been no stay issued, and AT&T is proceeding with the installations. The boxes cannot be placed underground because 1) the boxes contain air conditioning fans, which need above-ground vents, and 2) the underground space is already used by other utlilities (water, sewer, electricity).